Are you looking for a canopy tent that won’t take up your entire backyard? Do you need a canopy that can provide a little bit of shade without being a massive commitment? Do you find yourself struggling to carry and set up larger and more spacious tents? If so, you may need a 5x5 canopy tent as part of your backyard or traveling setup! With a smaller tent, you can accomplish a lot more than you may realize. These tents are designed to be easier to operate and transport than their bigger counterparts, and you’re likely to have great results from yours from the moment you bring it home and get started using it. Set up a small tent like this in your backyard to protect your grill and other pieces of smaller patio furniture and accessories from rain damage. A 5x5 tent is a great way to protect yourself and some additional items from the sun if you want to give out information about your business or charity at a local event. Use a tent like this in your garden to keep the hot, direct sunlight away from smaller plants that may not be able to handle it yet. Of course, there are a lot of other great uses for small tents like this, so bring one home today and see for yourself what a difference a 5x5 tent will make in your life! The American Phoenix Canopy Tent is a great low-cost small tent that comes in a few different colors and is designed to withstand rust and corrosion. It comes with stakes and is designed to be used in wind, rain, and direct sunlight without being too easily damaged. The tent is easy to set up and take down alone. This is the most affordable small tent on our list today. Some products may arrive with defective buttons on the legs, making this product unusable for safety purposes. The zipper on the carrying bag is known to break very easily. 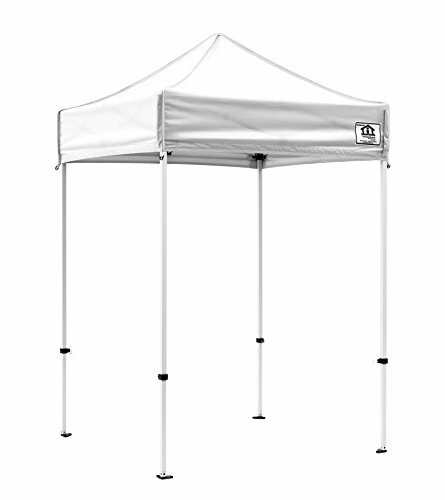 Bring home the OTLIVE 5x5 Canopy Tent when you want something quick and easy to assemble for your next outdoor event. This black canopy with a black frame is made of Oxford cloth and powder-coated steel to provide a high-quality and long-lasting experience. Although it’s made of steel, this is a lightweight canopy that’s easy to transport. 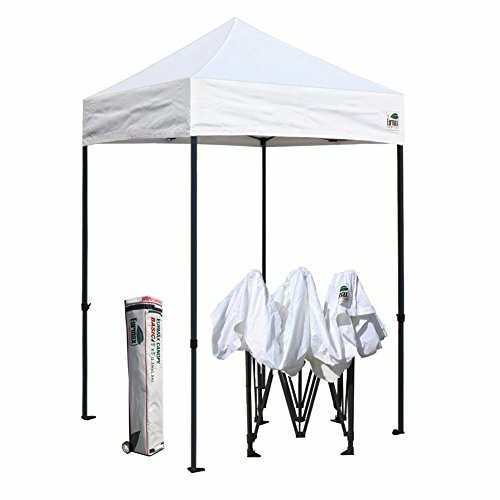 The canopy is very easy to set up and take down without help. This canopy is less sturdy in the wind than some others listed here. The canopy is only available in black. With this 5x5 Feet Canopy Tent in your backyard or at your next event, you’ll be able to accomplish everything you want to and more without worrying about damage from the sun or rain, either. 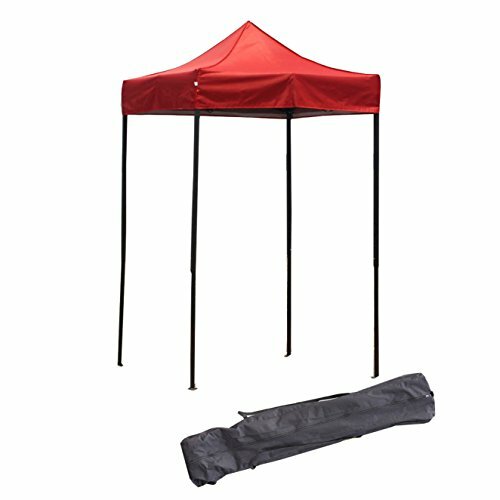 This gazebo-style pop-up tent is made of Oxford cloth coated in PVC and has a powder-coated steel frame that’s sturdy enough to stay in place well once you get it set up. This tent comes in several different frame and canopy color combinations. The tent comes with a durable carrying bag for storage. The tent doesn’t come with any stakes or guide ropes, so you’ll need to buy these separately. In rare instances, the canopy may arrive missing some required pieces. If you’re looking for a 5x5 tent that’s available in tons of different colors to suit almost any need, you need the Eurmax Easy Pop Up Tent. This tent comes in 15 total colors, all of which are vibrant and resistant to damage from UV rays. The tent itself is made of commercial-grade steel and polyester, and it features a UPF 50+ rating so you know you’re always going to be protected from the sun when you’re underneath it. The fold-up design of this tent is as easy to set up as an umbrella and just as simple to take down, too, even without help. The tent comes with a carrying bag, stakes, and ropes to set it up properly and store it well, too. The tent doesn’t come with any sidewalls and also doesn’t come with hardware needed to hang optional sidewalls, either. Some customers feel that this tent is too heavy for traveling purposes, even when it’s folded down and stored in its included carrying bag. Choose the Impact Canopy EZ Pop Up Canopy Tent when you’re looking for a commercial-grade canopy that will hold up to a lot of wear and tear. This canopy tent is a folding design that’s made of polyester fabric and a powder-coated steel frame for maximum durability and longevity, too. This tent is a great simple but effective product that is sure to quickly become a favorite for you and your family too. The polyester fabric canopy top is designed to be flame retardant so it’s even safer than ever before. The kit comes with ropes and stakes needed to set it up and secure it in place with no trouble. This is a pricier option that may be over budget for some customers. The tent may be a little bit challenging to keep clean. Were you able to find a 5x5 canopy tent that works well for your needs? 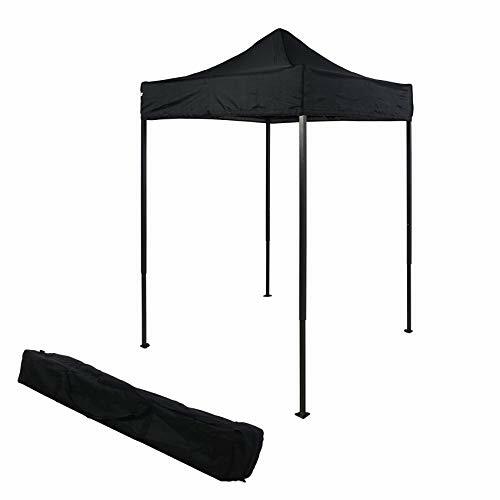 There are plenty of great options out there, and although this a less common size of canopy tent overall, it’s still a wonderful addition to your backyard, garden, local event setup, camping gear, and much more. Don’t be afraid to get creative about the different ways you may be able to enjoy the benefits of your canopy tent when you pick your favorite one, too! And remember, if you’re a shorter person who has trouble reaching the taller tents for setup purposes or if you just tend to struggle with bigger canopies overall, you can’t go wrong bringing home a smaller variety. Although they work on the same principle as the bigger tents, they’re easier to put together and take down too, so you won’t have to worry as much about the challenge of operating them. And since they’re smaller, they’re easier to stake down to the ground as well, so you’ll have even more benefits from bringing home one of these great tents right away.